Q1. Router R1 has been configured with the redistribute ospf 1 route-map fred command under router eigrp 1. The route map named fred needs to be configured to match routes to determine which routes are redistributed into EIGRP. Which of the following answers lists an item that cannot be matched by route map fred? Answer: E. Because OSPF does not use hop count as a metric, the information about the number of hops is not available in OSPF routes in the IP routing table. The other answers list items that can be matched with the route map match subcommand. Q2. Router R1 refers to route-map fred when redistributing from EIGRP into OSPF. The entire route-map is listed next. Which of the following answers must be true based on the configuration as shown? a. The third route map clause will allow any routes not already filtered by the first two clauses. b. Routes permitted by ACL “two” will be redistributed. c. Routes denied by ACL “one” will be redistributed. d. All routes will be filtered. Answer: A. The deny clauses in the route map mean that the route map will filter routes matched by that clause. The permit or deny action of the referenced ACLs just defines whether the route is matched. So, routes permitted by ACL “two” will be matched and then filtered due to the route-map clause deny action. Routes denied by ACL “one” simply do not match the route map clause numbered 10; such routes may or may not be redistributed depending on the next two clauses. Clause number 100 does not have a match command, meaning it matches all routes not otherwise matched, with a permit action, allowing these routes to be redistributed. Answer: A and C. The problem states that R1 has learned OSPF intra-area routes for 10.1.1.0/24, so show ip route will display that subnet. As an intra-area route based on a Type 2 LSA, the show ip ospf topology command lists the summary of the LSAs, including the 10.1.1.0 subnet number for that Type 2 LSA. However, because the redistribution filtering discards subnet 10.1.1.0/24, this value will not be included in the EIGRP topology table. Q4. 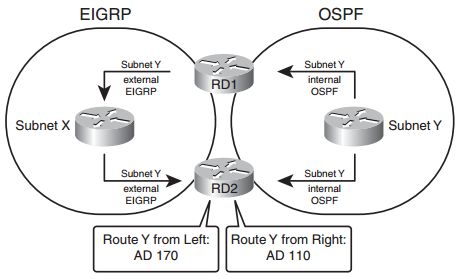 Router R1 is redistributing between two OSPF processes. Given the configuration shown, which includes all commands in the route map named fred, which of the following answers is true regarding the redistribution into OSPF process 1? a. No routes are redistributed because a route cannot be both E1 and E2. b. Only OSPF E2 routes in the OSPF 2 domain will be considered for redistribution. c. Inside the OSPF 2 domain, any formerly E2 routes will become E1 routes. d. Routes permitted by ACL 1 will be redistributed, regardless of whether the routes are E1 or E2 routes. Answer: B. The external 2 parameters on the redistribute command act as matching logic; only routes from the source routing protocol (in this case OSPF 2) that match this extra logic will be considered for redistribution by this redistribute command. The set metric-type type-1 route-map subcommand sets the route type as it is injected into the destination routing protocol (in this case OSPF 1); this logic is not used for matching the source routes. The routes permitted by ACL 1 will be redistributed, but only those that are also E2 routes from the (source) OSPF 2 domain. The redistribute function will not change the attributes of routes inside a single routing domain, but only in the destination routing domain (OSPF 1), so the configuration has no effect on the OSPF 2 routes that remain in OSPF 2. Q5. Which of the following is not true regarding IOS default settings for administrative distance? Answer: C. EIGRP, by default, sets a different AD for internal (90) and external (170) routes. The rest of the answers are accurate regarding default settings. Answer: A. All the answers list reasonable options in some cases, but the only feature listed that is useful with all three routing protocols is the route tag feature. RIPv2 does not support the concept of differentiating between internal and external routes, so the two answers that suggest setting administrative distance (AD) based on the route type (internal or external) could not be used in all three routing domains, as required by the question. All three routing protocols support setting route tags and setting the AD per route; however, because RIPv2 cannot match based on the route type (internal/external), the option to set the route tags is the only option that applies to all three routing domains. Q7. A co-worker is developing an implementation plan for a design that uses OSPF 2 and RIPv2 routing domains, with two routers redistributing between the two domains. The co-worker asks your help in choosing how to prevent domain loops by setting administrative distance. (This chapter uses the term domain loop to refer to the long routes that might be chosen for routes when redistribution exists–for example, a route may forward packets from the EIGRP 1 domain, to OSPF2, back to EIGRP 1, and then to subnet X in the RIP domain.) Assuming all other related settings use defaults, which of the following would solve the domain loop problem? Answer: D. AD can be used to prevent the domain loop problem with two routing domains by making each routing protocol’s AD for internal routes be better (lower) than the other routing protocol’s AD for external routes. RIP uses AD 120 for all routes, with no distinction of internal or external. As such, OSPF’s internal default AD settings of 110 meet the requirement that OSPF’s internal AD (110) is better than RIP’s external (120). However, RIP’s default of 120 is not better than OSPF’s default for externals (110), so the distance ospf external 180 command changes that setting to meet both requirements. The three wrong answers, while syntactically valid, do not help meet the requirements. Q8. Router R1 sets a route tag for subnet 10.1.1.0/24 when redistributing from OSPF into EIGRP. Which of the following unit is assigned to the route tag? e. No unit is assigned. Answer: E. Route tags are unitless integers that can be given to a route and even passed between different routing protocols by routers that perform redistribution.